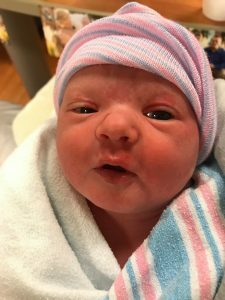 Marie’s birth story – A Hypnobabies success!! On Wed Sept 13th I woke up with some weird pressure waves. Braxton Hicks felt tight at the top of my stomach, and then went away, rarely painful. These started at the top of my stomach and continued tightening all the way down my stomach, staying tight for a while, and they were uncomfortable. I went back to sleep, and slept on and off for about an hour and a half. Cris called me around 12:30 pm and said she was coming over. I took a quick shower while listening to my Hypnobabies track, and then sat down for some lunch. I went outside for a walk around my yard, and called my husband to tell him what I was feeling. I was even more convinced when I used the restroom, and saw the toilet paper was a fresh red color, knowing it was bloody show. Cris and I packed up and headed out around 1 pm. By this point, my pressure waves were strong, but they still weren’t very regular or steady. I was really grateful to have Hypnobabies. My husband was right outside my door when Cris and I arrived at the hospital. When the nurses checked me, they said I was already at a 7. It was about 2:30 pm, and I finally allowed my husband to contact my family and let them know our baby was on her way. The lights were turned off, my hypnosis tracks were turned on, and my birthing affirmation signs (which I had made) were hung up all over the room. I let them put the monitors on me, and then had a calm discussion when I refused anything with needles. When my midwife arrived, she suggested piercing the bag of waters, meaning poking a small hole in it to allow it to slowly drain, which would allow baby to descend on the cervix gently. I took half an hour for the “Deepening Hypnosis” track, and then she pierced the bag of waters at 4:15 pm. By 4:50, my pressure waves were quite intense. For each one, I was really concentrating on my Hypno-anesthesia, telling myself “Relax”, and humming through the whole thing, and my husband and Cris would push down on each of my shoulders to help with my Relax cue. My midwife and a nurse joined in, during pressure waves they would each push against one of my knees, using counter-pressure against my back to ease discomfort. Someone was also placing and replacing cool washcloths on my forehead and the back of my neck. At 5:15 pm, I feel the need to push. My midwife checked me, said I was at a 9 and 1/2. She said it would be better if I could wait to push, but if I couldn’t wait, she could hold the tiny lip of cervix out of the way and I could push. I opted to push, since I was barely holding back. I started pushing at 5:25 pm, waves were coming fast and close now, a very intense desire. I was using my front stomach muscles, the ones I had felt the Braxton Hicks in. 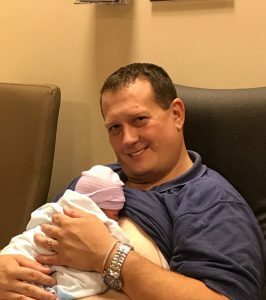 After a couple pushes, the baby was crowning, but my midwife told me to stop pushing. Holy goodness, it was hard to stop! But I did, and she directed how to readjust my body so the baby could safely be born. (((The next day, my midwife said she was amazed that I had so much control over myself that I was able to stop pushing on command. There were very few women she had ever seen or heard of who had that much control. Yay for Hypnobabies!))) As soon as I was in a better position, she said I could push again, and I immediately felt the difference. I felt the baby moving down more and more, and felt her moving out of my body. I was feeling powerful and strong, and was growling as I pushed (think “I am woman, hear me roar” Helen Reddy style of strength). My baby girl was born at 5:40 pm and was put on my stomach as my husband cut the cord. I was amazed at this beautiful, tiny human who had grown inside me for almost a year and was now right in front of my eyes for me to touch. The nurses wrapped me in warm blankets, brought my 6lbs 4oz 18in baby girl to me, and I started working on getting her to nurse. At 8pm, my mother and dad arrived with my two children, who were ecstatic to meet their new baby sister. My Littles were getting more and more wild the later it got, so around 9 pm, I sent the four of them to go home. When they left, I had a few minutes all to myself (since my husband was still with our daughter in the nursery). I spent it praying to my Heavenly Father, thanking him for being with me and helping me have such a wonderful and amazing birth, and reflecting on the day with Him. It felt good to pour out my heart and express so much. It had been an amazing day, a perfect Hypnobabies birth (for me), and I had my sleeping beauty baby finally in my arms.